i sometimes live vicariously through your photographs – thank you very much for the adventure. beautiful, lively combination of colours, so different from the usual “grown-up” colours european older women tend to wear. do you know why she is tattooed? The poor use body art to adorn their bodies…usually at birth or at adolescence. This is typical Jaipuri (from Jaipur(Rajasthan)) texture of Saree. See the pattern of Saree. These patterns have been evolved over a long period of time and the combination of red, blue and white is just amazing. Again, like in the previous post, this is a great scene. It looks like you captured a very peaceful moment on this woman’s daily life. It looks so real, like I could just go and touch or smell some of those pretty fabrics in the background. And those colours she is wearing, brilliant: the orange and purple with the white print, so vivid and youthful, so full of energy. Perhaps she is wearing the same sort of outfit she used to wear in her 20s, including those great sandals. Seeing all this in a woman of her age is specially moving and wonderful. And the way the fabric falls over her arm and creates all those pleats and volumes… Beautiful shot Sartorialist! beautiful, natural photo of how life truly is in india for most. The sari is envitably an indian staple, whether it comes across as “touristy” or not. The sari is indeed handmade, as fraise said. It is a bandhej or bandini; a literal translation would be “to tie”. So each and every white dot has been tied by hand, a pattern formed,and then the fabric is dip-dyed. Remember the sari is six yards long so you can imagine the work involved. Thanks for the comments from folks who are knowledgable about the fabrics and daily life that these photos convey. I always enjoy when you capture a person in motion, Sart. Such beautiful colors. This may be the kind of shot you were originally trying to avoid (“great color” blah, blah), but there is a reason people take those pictures in India. Color, and the appreciation of it, seems to be a truly integral part of life for Indian people, and when we see it, it’s impossible not to be seduced by it. Your eye is not being watered down by that. As in all of your shots, we can use it as inspiration for our own wardrobes. Wow! Thank you “sukesh kumar”, “fraise”, anon 10:52, and anon 1:44 for your wonderful insights! :) I had no clue that each white dot needs to be tied! That’s amazing, and the woman looks very pretty! Older women need to wear more vibrant colors! Love her chapals, toe rings, and bangles.. I love the toerings and the toe-ring-style sandals. Her feet are intriguing. I think that style of sandal is very common there, but it is so attractive and practical. I’m loving the bandhini and the colours especially since our last winter storm in Toronto was only last week. The colours are inspirational especially when all else [here] is white! GASP! Look at her tattoos and her colors, she’s amazing! Thanks to anon 1:44 for info about tattoos, does anyone know any more? It’s a lovely photo, Sart. I trust you bought your wife a beautiful sari. And, your little girls, too! But, it’s difficult to choose, isn’t it, when each piece of fabric is more beautiful than the last. Much love to you in your travels. Wow! I stay in this city and you’re making me fall in love with it all over again! Purple and orange, one of my favourite colour combinations. Many call me crazy, of course, but I just love the way they contrast. that flash of bright purple sleeve is simply divine! I think it’s absolutely gorgeous! 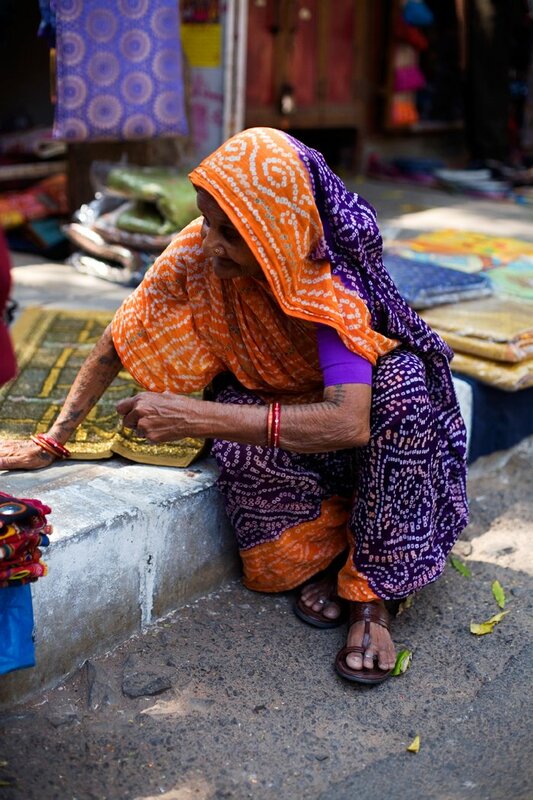 I love the colors and patterns of ethnic fabrics—whether from India or other countries. Sart, did you find her near Janpath? I think she is laying out handmade/embroidiered cushion/pillow covers on the sidewalk (aka footpath in India) to sell near the Janpath market. When I was there last, I saw a lady just like her and she spoke to me in perfect English – absolutely correct grammer – bowled me over. Anyways, it is a Rajasthani/Bandhej sari as someone noted above. The tattoos are also ornamental (sometimes though they are both “body art” and practical with peoples names and villages on them) — Rajasthan is absolutely beautiful. It is not chic like Mumbai or Delhi (or NY or Milan) but Rajasthan is seductive with its use of color. You will end up taking what otherwise have put put down as “touristy” shots but you might enjoy going to Rajasthan. Thank you for helping me experience home away from home. Enjoy Holi in India! Take some pics. Truly a strong and vibrant lady captured in this picture. Hoping to go to India one day. My father side came to Jamaica to work the sugar cane fields, so I have always wanted to visit to pay tribute to their sacrifice. This shot is so vivid that it’s almost like you brought us to India. I love the colors and the candidness of it – and also how I can almost feel that patch of sun shining through nearby, and hear the sounds of the surroundings :).